Tetra Pak offer a wide range of positive displacement pumps. Each pump is customer configured, that’s why there’s no part numbers in this chapter. Contact your Tetra Pak representative to get more information. The SX range of rotary lobe pumps is designed for awide range of demanding applications within speciality food industries. Validated by the European Hygienic Equipment Design Group (EHEDG) as fully CIP clean-able to their protocol, the SX range is ideally suited for applications where the integrity of the media is paramount. SX pumps are also suitable for Sterilisemin Place (SIP) cleaning procedures. SX pumps provide flow rate performances up to 115 m3/h dependent upon the application. The SX is currently the only EHEDG accredited pump range in which all seal options are considered to be truly front loading. This unique design provides the optimum seal positioning for maximum cleanability with fast and simple maintenance. This device provides easy access to the product seals thus eliminating complex disassembly thereby considerably reducing downtime. Combined with this the unique geometry of the design ensures that the cleanability of the pump head is maintained. High precision rotors provide high volumetric efficiency, low shear pumping action and smooth output flow. The stainless steel four-lobe rotors run with close tolerance clearances within the casing with no metal-to-metal contact thereby reducing the risk of system contamination. rotor/shaft spline are used in place of ‘O’ rings in all pumped media/atmosphere interfaces providing the optimum in static sealing. 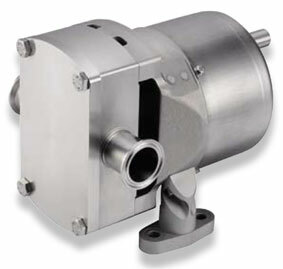 The SRU range of rotary lobe pumps is designed for use in a wide diversity of applications within the dairy, food, beverage and other such industries. SRU pumps can handle from low to high viscosity media and are suitable for Cleaning in Place (CIP) and Sterilise in Place (SIP) procedures. The characteristic smooth, low shear pumping action of the SRU is ideal for pumping media such as creams, gels, emulsions, aerated mixtures, and delicate cells and organic solids in suspension. SRU pumps provide flow rate performance up to 106 m3/h dependent upon application. The robust construction of our SRU pumps features a heavy-duty cast iron gearbox incorporating taper roller bearings for maximum reliability in the most arduous applications. As standard all media wetted pump head components are manufactured in 316 type stainless steels including the pump shafts. High strength Duplex, stainless steel shafts are used on all SRU high pressure models. Other material options are available to order. 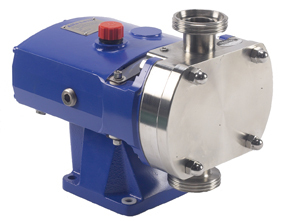 SRU pumps are available in both horizontal and vertical port configurations with progressive port sizes and connection options to provide maximum compatibility with existing installations and processes. High precision stainless steel Trilobe rotors are the standard for the SRU range with bi-lobe rotors providing alternative rotor geometry and non galling alloy material options for special applications. All rotor options operate with close tolerance clearances within the casing with no metal-to-metal contact thereby reducing the risk of system contamination. Involute splines enable precise radial location for the rotors and provide maximum power transmission. In combination with the precision rotors this feature permits minimum rotor clearances for high efficiency operation as well as guaranteed rotor interchangeability. SRU pumps offer a choice of sanitary seals available as single, single-flushed and double-flushed arrangements in a wide variety of material configurations to suit the most demanding application. A wide variety of prime mover options are available which can be configured to suit your requirements. Standard electric motor drive units can be mounted on our stainless steel bases or mobile trolleys depending on application needs. SRU pumps are designed with an air space between the gearbox and pump head which, in conformance with USA 3A guidelines, reduces the risk of cross contamination and enables any leakage to be detected easily. The OptiLobe range of rotary lobe pumps combines cost-effective simplicity with quality and reliability. The OptiLobe can be used for general applications within the Dairy, Beverage and Food Industries. The OptiLobe has been certified by EHEDG (European Hygienic Equipment Design Group) as fully CIP cleanable to their protocol, and therefore is ideally suited to applications where cleanability is paramount. Also the OptiLobe conforms to USA 3-A Sanitary Standard and all media contacting components are FDA compliant. The pump features the "EasyFit" front loading seal which allows quickly and easy inspection or replacement without the need for pipe work disassembly. The OptiLobe is compact, efficient and capable of flow rates up to 48 m³/h and pressures up to 8 bar. The OptiLobe has a universal gearbox design which gives the flexibility of mounting pumps with the inlet and outlet ports in either a vertical or horizontal plane by simply changing the foot position. A stainless steel gear canister and electro-less nickel plated bearing housing provides a clean, paint free corrosion resistant external finish. The OptiLobe has sanitary design full bore inlet and outlet ports to International Standards, maximizing inlet and outlet port efficiency and NPSH characteristics. 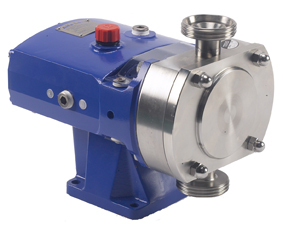 Pumps are fitted with tri-lobe rotors rated to 130°C facilitating use with CIP processes. Gear canister - 304 stainless steel. Bearing housing - electroless nickel plated cast iron. Shafts - duplex stainless steel. Pumphead - product wetted components in 316L . Product wetted elastomers of EPDM, FPM all FDA conforming. EasyFit type single or single flush/quench mechanical seals. All sealing options are fully front loading and fully interchangeable. Specialized seal setting of the mechanical seal is not required as the seal is dimensionally set on assembly. This feature further enhances fast and efficient on-site seal interchangeability. Dairy, Food, Beverage, Pharma and Personal Care markets. The highly efficient design is particularly suited to applications that are low in viscosity with medium to high discharge pressures. SCPP-1, Robustly designed and well suited for Strip-Clean applications. Contact your local Tetra Pak representative to get more information about the different options.